There might be times when you want to rent two (or more) rooms as one or split one room into two or more separate spaces for rent. This is the essential function of the merge/split office feature. To get started, go to Space > Products. Please note that before merging or splitting any spaces, they need to have been previously added as products into the system. Please also note that only the Office product type may be used with this feature. Read more about how to add an Office to Operate. You can also have a look at using list views or searching through your records, if you have trouble finding the space you need. When you merge an office, a new one is created and the previous ones will be discontinued. This means that your occupancy reporting will still be accurate for the time frame selected. 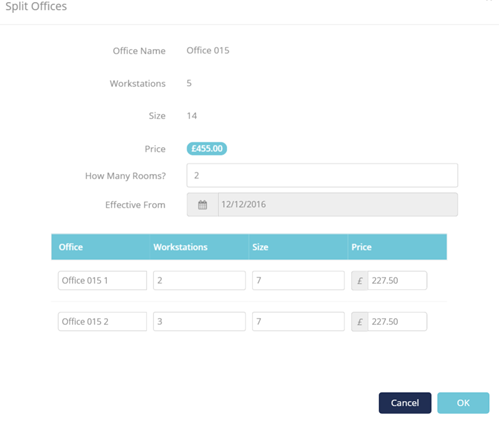 To merge two or more office spaces into one, select them in your products list, then click Merge Offices at the top. Next, Operate will automatically merge the properties of your selected spaces and will give you a sum total in the window that comes up. You can make changes if needed. Click OK to finish then check your products list for the merged entry. This is separate from the entries that you have previously selected, therefore your list will contain both the separate spaces and the merged one. 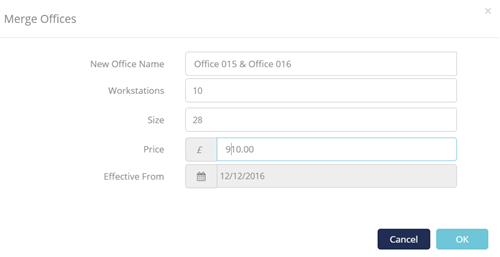 To split an office into two separate spaces, select it in your products list, then click Split Office at the top. You can only split one office at a time. Next, Operate will automatically divide your office properties by 2 (e.g. : square feet, workstations). You can choose in how many rooms to split the office and the properties will be divided by the number of rooms you set. Use the list of rooms that is being created below to name your offices, add the number of workstations, the size (in sq. ft.) and price. Click OK to complete the split. You will now have the initial office that you split, as well as the separate offices you have just created.